Welcome to the new page for Year 3. This will be updated throughout the year, so keep your eyes peeled for photographs, information and other fun stuff that will show you what we have been up to. We hope you enjoy stretching your brains as much as we do! We became actors and actresses, rehearsing our scripts using our book 'Ug. The Boy Genius of the Stoneage'. The children focussed on their actions and voice to show how their character was feeling. They then performed their part of the story on the stage, making sure that they projected their voices and read their lines correctly. We had great fun and gave fantastic feedback to everybody that performed, so have a look at some photographs! Today we painted some cave paintings, just like they would have done in the Stone Age. We were only allowed to use our fingers to do this so we had to be very careful and concentrate on making it as neat as possible. The pictures that the children completed are fantastic, and will be going up on our wall to decorate our year 3 cave! Everybody in year 3 has brought in their own pebble and we have began to look at where these may have came from and what they are like. In science, we investigated what different layers there are in the Earth and we went outside to represent the inner core, outer core, mantle and crust. In English, we worked with a partner to find the best ways we could describe our rocks so that we can use these words throughout this half term. We have already realised that all of our rocks are very different, and we are all very curious to find out why! Today we started reading 'The Pebble in my Pocket', which tells us all about how rocks were formed millions of years ago. It is packed with lots information and so to remember the different stages of the rock, we have began to put it into movement. Today, we have been making our very own chocolate rocks in our quest to become ROCK STARS. We looked at the 3 different types of rock and how they are made. These are sedimentary, metamorphic and igneous rocks. We focussed on melting the chocolate and layering it to form sedimentary rocks and we will be looking at them next week when they have set! Today, we finally got to uncover our rocks that we had made last week and see what they looked like inside! We found that layers had formed and discussed how this was just how sedimentary rock was made from layers of mud, sand and small rocks. Every Wednesday afternoon, we take part in French lessons where we try our best to learn the key vocabulary. 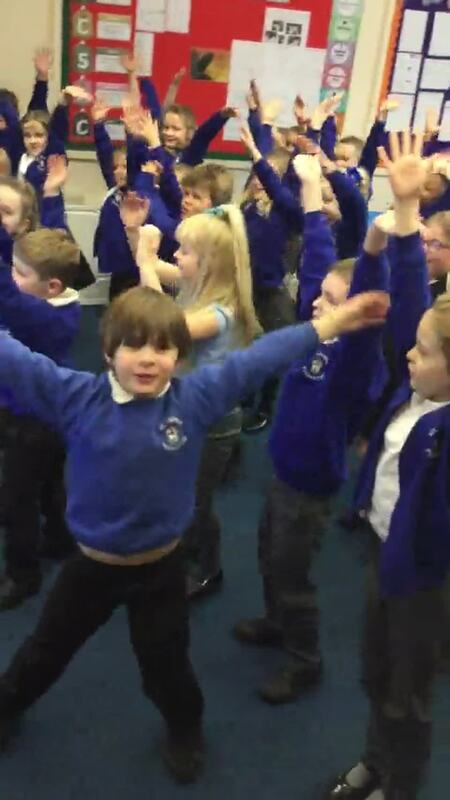 Today, we were looking at different commands we can give in French such as, stand up, listen and put your hand up. This will mean that I can use these during lessons and the children can respond in the correct way. Today, we used oil pastels to show what happens when a volcano erupts. We decided that we would use warm colours such as red, orange and yellow to show how hot the lava is. Also, we looked at vocabulary we could use to describe the volcanoes and the children chose their favourite words to surround their pictures. During the afternoon, we looked at whether we would like to live next to a volcano and came up with the arguments for and against this. The children then decided on their opinion on this matter and we took part in a debate, so that they could argue their points of view. We could see that everybody had different thoughts, and we discussed how there is no right or wrong because it is an opinion. The children came up with some very interesting ideas that I was very impressed with and had not even thought of myself! It is very important in Year 3 for us to learn our 3, 4 and 8 times tables. Today, we looked at building the 3 and 4 times tables using concrete objects and labeling them with what we know. The children worked in groups to produce these maths mats for either of the times tables. We looked at each other's and discussed the different patterns that we can see. Take a look below at what we found out. We will be looking at these all year and the children know that practicing them in school and at home will help with their fluency in all parts of maths! In year 3, we ended our rocks topic by looking at what soil is made from and the different layers in it. We built our own layers using marshmallows and cereal to represent the base rock, subsoil and topsoil. We also learnt that soil is made from organic matter, minerals, water and air! Have a little look at their creations in the gallery below. Have a look at our fantastic volcanoes that we made, decorated and erupted! We set them off by pouring red coloured water into the bottle, vinegar and bicarbonate of soda. This was very exciting and we even had a visit from year 5 to watch the lava foam pour down the sides of each volcano. We have been working very hard on our Christmas performance this year and the children took on the roles of our different characters, including the German and English soldiers that played football against each other on the night of Christmas. All 3 performances were fantastic and the children did us all very proud! We have also had our Christmas party where the children got into their best clothes, played lots of games and even got a visit from Father Christmas. Have a look at the photographs below to see our year 3 superstars, and last of all, I would like to wish everybody a very merry Christmas! Have a look below at what we will be learning in Year 3 during this half term. In science this half term we have been looking at how our bodies move with the help of our diet, bones and muscles. The children found out why we eat different types of nutrients including carbohydrates, fats, vitamins, minerals, water, protein and fibre. Look at the photographs below to see the children exploring nutrients in food as well as writing about different bones they know we have in our body and their purpose. We have really been getting into the Greek culture in year 3 by learning all about the country and the different foods that they eat. The children were very brave and tasted feta cheese, figs, Greek yoghurt, pitta bread and even olives! You can see from the photographs below that some children like it more than others. Look below to see what we will be learning this half term. For this year's World Book Day, our theme was bedtime stories, so we all came into school wearing pyjamas with teddy bears and cushions. In Year 3, we have been looking at Greek myths and we worked very hard in groups to use the Greek myth 'Eurydice and Orpheus' to change it into our very own bed time story with a much happier ending. We then read these out to the class as they enjoyed a cup of hot chocolate and a biscuit. As part of our Greek theme, I arranged for us to go on a trip to the World Museum in Liverpool. Here, we took part in an Ancient Greek workshop where the children could handle the artefacts and learn more about the art, Gods and battles that took place. We then used the rest of our day to explore the other exhibitions in the museum such as the Ancient Egyptians, the bug house, the aquarium, the planetarium and the dinosaur trail. We had a fantastic day and came away bursting with information! During this half term, year 3 and 4 had the excellent opportunity to go to Scotsman's Flash every week. Here we enjoyed a range of activities that included kayaking, sailing, rock climbing, archery and building. We all had a fantastic time whilst learning many skills and even being awarded a certificate! Have a look at the photographs below to see the amazing things we got up to. Have a look below to see what we will be learning over the next half term. During this term, we are looking at where people go on holiday and after using a map, we realised that a lot of people choose to go to the Mediterranean to experience the hot weather and the tasty food. Today, we looked at a classic Mediterranean salad and made our own by combining lots of different ingredients. We used our knives safely to chop each part up into small pieces before adding a dressing and mixing them. After we finished, we all sat and tasted our creations and I think a lot of the children were surprised about how much they enjoyed it! Have a little look at the photographs below to see the process we went through. During this half term, we were extremely lucky to work with Manchester Camerata as we went learnt all about George the boat and the Liverpool and Leeds canal. We visited Trencherfield Mill and they also came to see us at St. John's as we learnt all about it's history. 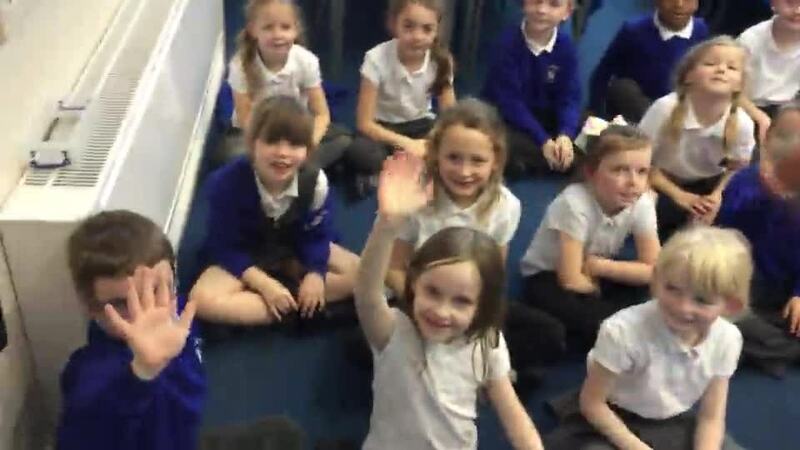 To show what we had learnt, we wrote a fantastic song, a chant, used musical instruements and even wrote letters about how our life would be like on the boat. We performed these on the boat for families to see and if you managed to attend, I am sure you will agree that they did us very proud! Have a look at the photographs below to see how hard our children had to work.